In New York City, the epicenter of global and American capitalism, populist-styled Democratic Mayor Bill de Blasio is approaching the end of his first term in office. De Blasio came to City Hall three years ago on a pledge to close the book on New York’s “Tale of Two Cities” – “[a] campaign critique of an increasingly unequal New York, characterized by rising rents, swelling homeless shelters, and racially skewed policing” (The Nation, 1/6/16). After twelve years of previous Mayor Michael Bloomberg’s direct rule on behalf of Wall Street billionaires, de Blasio’s slogan resonated with the progressive mainstream of New York. In a city where 46% of residents are either poor or near poor, his campaign came to represent hopes that the chants of Occupy Wall Street were finally traveling up Broadway to City Hall. Yet at the end of his first term, the situation facing working-class New Yorkers remains dire. Wall Street’s profits are booming, but the fastest growing jobs are in low-wage industries like hospitality and home health care (Center for an Urban Future, 5/16). Additionally, homelessness is higher than ever, topping out at well over 60,000 people, while the cost of housing skyrockets and racist policing continues to run rampant. At best, De Blasio has only managed some minor changes. It’s no wonder: despite big campaign promises, behind closed doors de Blasio has accepted huge donations from developers and big business. Between 2015 and 2017, De Blasio faced two investigations into possible corruption, but both investigations were dropped without charges in March. They did, however, reveal the extent of the ties between the populist-styled mayor and his friends and backers in big business. De Blasio is a prime example of the impossibility of adequately representing the needs of poor and working-class people without breaking with corporate cash. After Bill de Blasio took office as Mayor of New York in January 2014, he notched a series of early victories in an attempt to validate his progressive candidacy: establishing universal pre-K education (though foregoing his proposed tax increase on wealthy New Yorkers), scaling back the hated “Stop and Frisk” policy of the New York Police Department (though not discontinuing it entirely), and extending the right to paid sick leave to a further 500,000 workers in the city (though tipped and hourly workers received no compensation for lost shifts). Nonetheless, de Blasio has failed miserably in the critical arenas of housing affordability and homelessness. On housing affordability, de Blasio has quietly sought to court New York’s super-wealthy developers and real estate magnates while posing as a man of the people. The result? Developers are building more and more profitable new luxury developments that make neighboring housing more expensive and thereby displace long-time and poorer residents. This pattern has been endemic to New York for decades and has left most of Manhattan as an exclusive playground for the rich. Currently, an astronomical 65% of New Yorkers’ income goes to rent, an increase of 5% from 2015 (NBC New York, 4/21/16). Although de Blasio has slowed the rate of rent increases in the city’s stock of subsidized housing, the total number of subsidized housing units continues to dwindle as older tenants vacate properties. What is really needed to slow or reverse rent increases is a recognition that the for-profit housing market is completely broken and dominated by rich developers who only have an interest in their own bottom lines, not providing quality homes. Rather than collaborating with the developers, we need to help residents and communities organize to resist. We need a bold program of rent control, major investment in the New York City Housing Authority (NYCHA), and a major expansion of quality public housing. This will take a head-on confrontation with the power of New York developers and Wall Street speculators — with demands that they pay for these solutions with massive tax increases on the 1%. De Blasio is unwilling to fight for these serious measures since his developer funders strongly oppose them. Developer influence is rife in City Hall. De Blasio favors a streetcar that would stretch the Brooklyn-Queens waterfront at a cost of over $2.5 billion. The streetcar would connect expensive, newly-developed luxury apartments and condos on the East River while opening up Latino areas like Sunset Park, Brooklyn, to intense gentrification. The streetcar wouldn’t even be included on a monthly MetroCard – a slap in the face to working New Yorkers who rely on overpriced but shoddy subways and buses for transportation. “The only way that the streetcar proposal makes some sense is if one considers that seven developers with projects along the proposed route contributed a total of $245,000 to de Blasio’s nonprofit Campaign for One New York, which he shuttered last year during a federal investigation into possible pay-to-play schemes,” writes Gothamist (4/14/17). On homelessness, de Blasio promised to deal with New York’s growing homelessness problem when he took office in 2014. Then, there were about 53,000 people in the city’s main shelter system, which de Blasio called, “Unacceptable to the future of New York City.” Today, that number is over 60,000 people, in addition to thousands of others living on the street and in specialized youth and domestic violence survivor shelters (NY Times, 3/26/17). The surge in homelessness is a byproduct of the affordability crisis plaguing the city. As housing gets more and more expensive, people are forced onto the streets and into shelters. This includes thousands of workers and families with children. NYCHA, the city’s public housing system and the nation’s largest of its kind, has been systematically underfunded and many apartments are in poor condition, plagued with mold and asthma-inducing substances. Still, NYCHA has a decades-long waiting list and can’t begin to meet the city’s housing crisis. Without a serious check on the influence of big developers in City Hall, this crisis will only get worse. De Blasio stubbornly refuses to mobilize millions of angry, working-class New Yorkers for a broad program of rent control and public home building. But how could he, as he takes millions in campaign contributions from the very real estate developers who profit so handsomely from the construction of displacement-generating luxury housing? Mayor de Blasio campaigned on a platform of ending the NYPD’s outrageous and unconstitutional use of “Stop and Frisk” tactics. Soon after taking office, the NYPD did reign in – but not end – the practice. De Blasio’s decision was a necessary concession to the growing police accountability movement, staving off a bigger movement from threatening his term in office. With the heat turned down on Stop and Frisk, the unsatisfactory situation with “Broken Windows” policing and the inhumane conditions at Rikers Island have gained prominence. The suicide of Kalief Browder after a tortuous stint at Rikers Island along with scathing reports on the inhumane conditions there have raised a chorus of voices including from the City Council and the governor demanding that the prison be closed. De Blasio only recently came out in favor of closing Rikers after pushing back against the feasibility of it. Many see it as an empty election-year promise. He’s put forward a 10-year plan which is based on more than halving the Rikers population from over 9,000 to 5,000. An easy way to reduce the population at Rikers and to speed up its closure would be to end Broken Windows which refers to the issuing of criminal or civil summons for non-violent “quality of life” infractions. This is done under the false notion that these petty violations – like selling mango on the street or fare evasion – are a gateway to serious violent offenses. Broken Windows busts are enough to make an undocumented immigrant eligible for deportation under Trump’s new rules since anyone here illegally who is charged with any crime is considered a priority for removal from the country. The reality is that Broken Windows is a miserable failure. Study after study proves it doesn’t reduce violent crime. It does, however, criminalize poor and working-class people, particularly Black, Latino, transgender and other marginalized communities. The NYPD issued 30,000 fare evasion arrests in 2015, and 92% of arrestees were people of color. Summonses can easily lead to criminal records if “offenders” don’t show up or can’t pay hefty fines. But de Blasio has said, “We’re not changing a formula that works” (NY Daily News, 3/1/17). De Blasio’s championing of Broken Windows, together with his ongoing cooperation with ICE, reveals the insufficiency of his approach to defending New Yorkers against racist attacks coming directly from the Trump administration. This is why a substantial share of black and immigrant New Yorkers are souring on the mayor. An important figure in the anti-de Blasio movement is Constance Malcolm, the mother of Ramarley Graham. Graham was killed in 2012 when NYPD officers entered his home and killed the unarmed teen. The city paid $3.9 million in damages to the family. After the officer who shot Graham, Richard Haste, was found guilty in an internal investigation, he took up the option to retire with his pension rather than be fired. Malcolm replied, “Mayor Bill de Blasio, you show us again, time and time again, that black lives don’t matter to you…. If it’s up to me, he won’t get another term in this city, and I think the whole New York City should be appalled by this decision” (CBS New York, 3/27/17). A thorough review of de Blasio’s mayoralty requires a discussion of his serious campaign contribution scandals, and what it reveals about Democratic politicians who mime progressive phrases while taking bundles of corporate cash. Early in his term, the mayor established the “Campaign for One New York” to advance his legislative priorities. The Campaign was a non-profit with shady ties to the mayor that accepted mega-donations from friends and allies. The effort took in over $4 million in donations before de Blasio shut it down under intense pressure from the public. It was later revealed that over $2 million of the donations came from real estate companies (The Real Deal, 9/24/15). One architect, Ariel Aufgang, made a $2,500 donation in April 2015, and later received city approval for more than 930 new apartments. Under suspicion that de Blasio had sold political favors to donors, De Blasio faced parallel investigations from the Manhattan District Attorney and U.S. Attorney. However, in March 2017, both investigations were dropped without any charges. The mayor’s team continues to declare his innocence, but the foul stench of pay-for-play is unavoidable. De Blasio’s campaign contribution scandals must be viewed alongside his poor track record on housing affordability issues. As developer donors got paid out, working-class renters in need of serious solutions got sold out. Politicians can’t serve two masters. In February, Mayor de Blasio told WNYC’s Brian Lehrer he had “Seattle envy” after the Seattle City Council divested $3 billion from Wells Fargo in solidarity with Standing Rock’s protest against the Dakota Access Pipeline. De Blasio remarked, “[T]hey do such wonderful cutting edge stuff all the time.” (Office of the Mayor, 2/10/17). What wasn’t mentioned was that the divestment proposal itself came from the office of Socialist Alternative City Councilmember Kshama Sawant, who moved it on behalf of indigenous activists. Both Sawant and de Blasio were elected in 2013 in the shadow of Occupy and both gave voice to the anger of working people. But, unlike de Blasio, Sawant rejected corporate cash and instead based her election campaign and work inside the City Council on building movements of ordinary people. “What can be won inside the City Hall, depends on the strength of movements outside City Hall,” says Sawant. With just a single vote on a nine-member council, this strategy has allowed Sawant to help drive Seattle politics firmly to the left and dominate the city agenda, including winning the first $15 an hour minimum wage in a major city within six months of being elected. Perhaps de Blasio’s “Seattle Envy” stems from his personal disappointment that his re-election campaign has moved away from grand themes like “A Tale of Two Cities” and into small-ball promises (exemplified by his five-year plan to reduce homelessness by a paltry 4%). Sawant’s example, and the campaign of Bernie Sanders – who also rejected corporate cash, stood on a platform of radical demands that spoke and held rallies in NYC of tens of thousands of people – point toward the potential for building a new kind of anti-capitalist politics that fights for what working people need. There is a historic opportunity to build a challenge to establishment politics both in the electoral arena and in mass campaigns. Of course, NYC is very different from Seattle with a far more powerful establishment that has more ruthlessly stacked the deck. Defenders of de Blasio would also point to the ferocious resistance a number of his proposals received from Governor Cuomo – such as de Blasio’s failed attempt to limit the red carpet treatment for charter schools which contributes to undermining public education. There is no doubt that Albany has enormous power over the city which can be deployed by the corporate establishment to thwart a progressive agenda. But this points all the more to the need for building a mass movement. At the moment a proposal for a single-payer health care system in New York State is only a vote shy of a majority in the State Senate from passing and being put on Cuomo’s desk. Why is de Blasio not fighting and helping to mobilize for this very popular and very needed reform? NYC has a vibrant progressive left. We have the highest union density of any city, countless social justice and progressive organizations, and a surging socialist movement with the Democratic Socialists of America now having more than 2,000 local members. We can develop the foundation of a strong, united left challenge to the establishment by articulating a clear pro-working class platform and uniting around a common agenda that starts with what working people need, not what developers and Wall Street will allow. This would include many things that Bernie Sanders proposed, like massive tax increases to pay for jobs, Medicare for All, massive investment in the creaking MTA, a right to housing, action on climate change and free college education. Such an agenda could win massive support in New York, but it will be viciously opposed by big business and the Democratic Party establishment. Elections won’t be enough. We will need to develop a strategy that relies on mobilizing the social power of workers and young people. This means rejecting corporate cash and all ties to big business and not endorsing or supporting candidates who take corporate cash. We need candidates who will be accountable to our movements in a meaningful way. It means building mass movements, mass membership organizations, and using vibrant, people-powered election campaigns to build our movements. It means activating the social power of millions of working-class New Yorkers through radical community organizing and employing tactics that leverage our social power like mass actions, walkouts, and strikes. De Blasio’s first term reveals the total inadequacy of relying on even the most liberal establishment candidates. Instead, we should rely on our own power. A new raft of pro-worker, anti-corporate independent candidates are needed to challenge one-party Democratic rule in cities like New York. The world has changed. Capitalism cannot deliver an equitable and affordable city. Thousands of people have drawn the conclusion that the 1% have too much power. 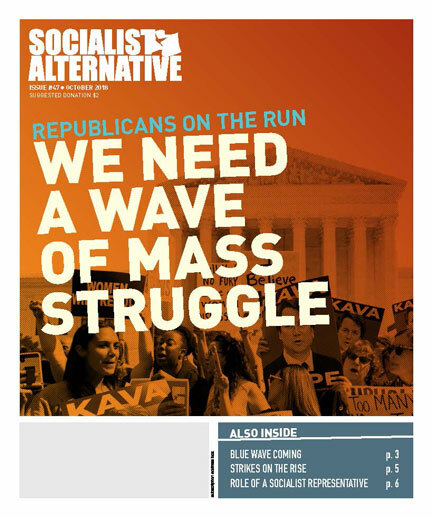 There is a growing space for challenges to the left of the establishment and a surge of interest in socialist and broadly progressive politics. As Seattle has shown, with the correct strategy even one socialist councilmember can make a world of difference, shifting the debate and empowering workers to set their sights higher than the current system allows. Together we can re-set priorities where they need to be: on the fight for economic and social justice and a socialist world. If you agree, join Socialist Alternative.